Formed in 1998, Banquo Folk Ensemble encompasses early and traditional music from all over Europe from the 12th century to the present. Passionate about the sound and style of the ancient and early repertoire, the ensemble remains rooted in the folk tradition, capturing the essence of the periods, without being obsessive about historical accuracy of performance. 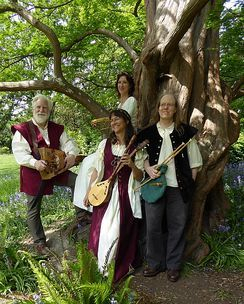 With a touch of theatre and over 20 instruments — including voice, several small European bagpipes, harp, hurdy-gurdies, shawm, cittern, recorders, Irish flute, percussion and more — Banquo Folk Ensemble aims to transport the audience away from the modern day to a simpler time and place, letting the music speak with its own voice.